March is National Nutrition Month: Assess your health and find a specialist who can help you! Fed up with ineffective fad diets and unwanted pounds? Confused by mixed messages about what’s healthy to eat and what’s not? There is an overload of information and misinformation in the media and online about health and nutrition. Perhaps it’s time to weigh in the merits of getting professional help. This could actually be a lifesaving decision: Diabetes and obesity are at all-time highs and heart disease is still the leading cause of death for women in America. There are countless dietitians who specialize in nutrition and weight loss at medical institutions and private practices in New York City. How can they help you? And how can you find one to meet your needs? I connected with Rachel Lustgarten, a Registered Dietitian with the Weill Cornell Comprehensive Weight Control Center at 1165 York Avenue. Directed by Louis J. Aronne MD, who founded and ran a successful weight control program in the 1980’s. Weill Cornell Hospital adopted Dr. Aronne’s program several years ago. Weight loss is a challenge, Rachel notes, especially for menopausal women who gain weight due to decreases in their estrogen levels and, as a result, are susceptible to type 2 diabetes, cardiovascular disease and high blood pressure. “As we age we tend to become less physically active and see a decline in lean body mass. This leads to a decreased metabolic rate—the rate at which we burn calories throughout the day,” she points out. A certified dietitian can help you incorporate exercise safely into your daily routine by figuring out how many calories you can absorb daily (what you eat) based upon the amount of exercise you do (how you move). Other concerns for women as they age are the increased possibilities of osteoporosis and osteopenia. 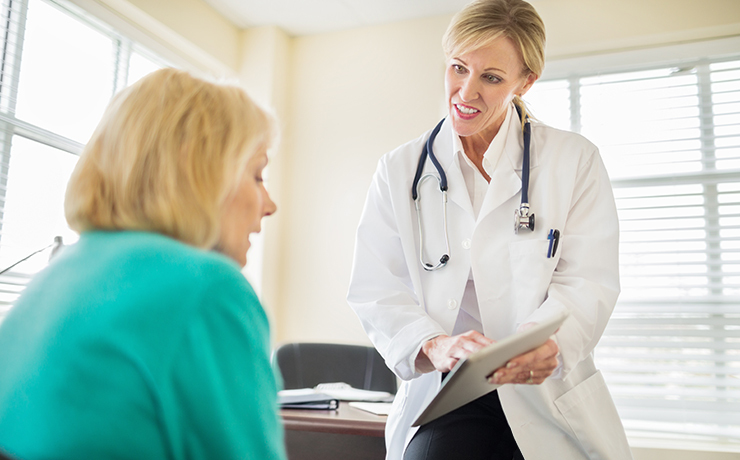 A dietitian will review your health history, your lab tests and your bone density tests. Based upon these findings she or he will offer dietary or supplement suggestions to ensure that you are absorbing adequate calcium and vitamin D. In addition, a skilled dietitian will counsel you on healthy eating behaviors—how to time your meals and select food that will increase your energy, stabilize your moods and boost your feelings of being well-fed. Typically, after an initial evaluation, the patient and dietitian will devise a care plan based on the needs and progress of the patient. “Most dietitians will want to see new patients again within one to four weeks so that they can assess progress and trouble shoot if there are some obstacles to success,” explains Rachel. For convenience, some dietitians will make themselves available via phone, email or video conferencing to answer quick questions or even conduct full-length sessions. Fees can vary based on the practitioner or the center; some dietitians will accept insurance. And some insurance companies will cover costs or a portion of the costs for patients with a chronic health condition. In other cases, insurance might be accepted on an out-of-network basis. “Remember that working with a dietitian is an investment in your health and wellbeing,” advises Rachel, who believes that the expense far outweighs the money many people spend on fad diets or supplements and “too good to be true” remedies. The Academy of Nutrition and Dietetics, provides valuable information and notes additional reasons for going to a nutritional consultant. Since many people suffer from digestive issues, high blood pressure, hypertension or cardiovascular problems, dietitians can develop special diets for these issues as well as recommendations for proper hydration and foods that don’t interact with certain medications. In short, they can provide guidelines for eating smarter. The Academy also outlines the changing nutritional needs that come with aging and provides advice and helpful tips: Eat Right resources for seniors. According to www.Nutritionsciencedegree.org, dietitians are considered to be nutritionists, but not all nutritionists are dietitians. The role of a dietitian is more regulated than that of a nutritionist. A registered dietitian has a degree in Nutrition and Dietetics approved by the Academy of Nutrition and Dietetics (www.eatright.org) and has passed a national exam given by the Commission on Dietetic Registration. She or he has also completed an accredited practice program. Registered dietitians can be found in hospitals, healthcare facilities colleges or private practices. Weill Cornell Medicine Comprehensive Weight Control Center, Division of Endocrinology, Diabetes & Metabolism, 1165 York Avenue, 646-962-2111. New York Presbyterian’s Ambulatory Care Network Nutrition Services, provides individual and group counseling with registered dietitians for patients referred through their private physicians. Locations are at New York Presbyterian’s Weill Cornell Medical Center, 520 East 70th Street, 212-746-0838 and New York Presbyterian’s Columbia University Medical Center, 622 West 168th Street, 1-866-463-2778. Mt. Sinai/St. Luke’s Weight Loss Program, West 114th Street and Amsterdam Avenue, 212-523-8440. Offers weight loss groups that meet for 52 weeks; designed for adults who need to lose 50 pounds or more. Medically supervised, hospital-based; $60 per week and one-time $90 initial screening fee. No insurance accepted. NYU Langone Medical Center Weight Management Program, 530 First Avenue, 212-263-3166. Offers a wide range of surgical and non-surgical weight loss options plus nutritional and lifestyle counseling. Columbia University Weight Control Center, 161 Ft. Washington Avenue, 212-305-5568. Integrative approach to weight management with nutritional and lifestyle counseling, stress management, meal replacement plans and medication if necessary. Also, individual appointments with registered dietitians and a 12-week group program. Midtown Nutrition Care, 119 West 57th Street, 212-333-4243. The city’s largest nutrition practice with seven licensed and certified practitioners on board. Accepts insurance and provides counseling services for all diet-related conditions, including high blood pressure, diabetes and osteoporosis. Mary Jane Detroyer, 357 East 57th Street, 212-759-7110. Mary Jane is a registered dietitian, certified nutritionist, exercise physiologist and personal trainer with 20+ years in the health industry and specializes in helping women of all ages. She is the 2015 New York Dietitian Patients Choice Award winner. Initial nutrition consultation: $300, follow up: $185. Packages are available. Georgetta Lordi Morque is an award-winning freelance writer and public relations consultant who focuses on sports, fitness and health.